The Competition will be a qualifying strokeplay event over 18 holes. It will be played by the R&A Rules of Golf, together with any local rules. The entry fee is £15 to include meal. Entries are to be completed via BRS on-line system. The entry fee is payable at time of booking. It is limited to members of recognised golf clubs with CONGU handicaps (Boys 28 and Girls 36). 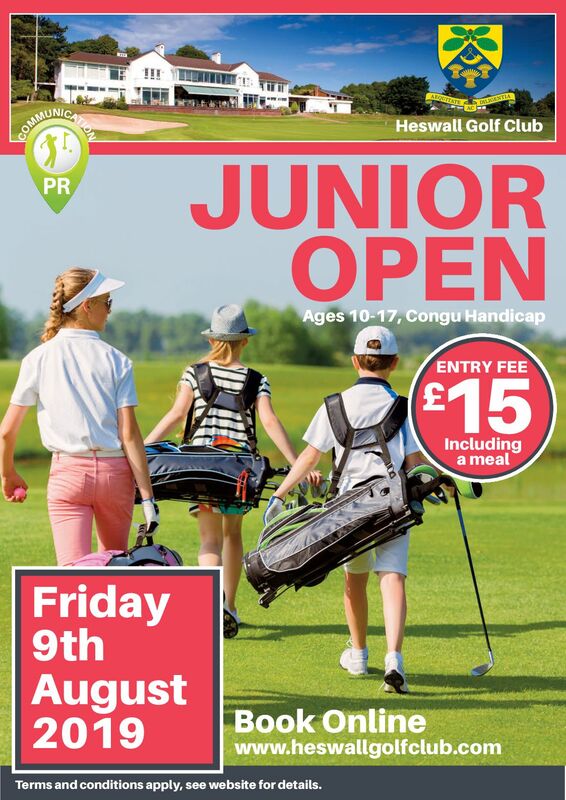 Competitors must be bona fide amateur players – Under 18 years of age on 9th August 2019. Entrants will be required to provide an active handicap certificate with CDH number on the competition day as this will be checked. All entrants must obtain parental consent to play in this competition. Heswall GC will accept no personal responsibility or liability as person liability/insurance cover should be in place for the individual. Any disputes will be settled by the Competition Committee, whose decision will be final. There will be prizes awarded for overall winners and Boys and Girls categories. No competitor can win more than one prize. The prizes will be awarded in the Clubhouse following the conclusion of the competition and winners are asked to attend the presentation.